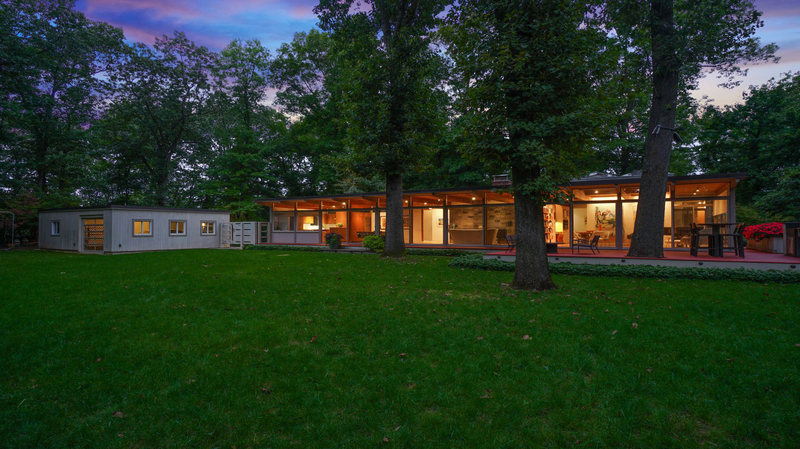 $2,395,000 THE BLITZER HOUSE, 1955 ARCHITECT HAROLD EDELMAN. Welcome to noted Kirby Lane North, an enclave established in 1947 by artist & writers to build their dream, modernist homes. DOCOMOMO International's local chapter recognized this community and also noted this special home. The current, second owners lovingly restored, expanded and improved systems throughout their ownership. Found on a cut-de-sac, and across from the enclave's swimming pool, this stunning example of Mid-Century Modern architecture lives beautifully within it's natural surrounds. Walls of glass look out onto green space, accented by mature trees and vegetation for ultimate privacy. Living within this minimalist, warm and inviting home architectural details will be admired and appreciated by all. The side entry professional kitchen with stunning Terrazzo floors is positioned for conversation and gathering. Open social spaces inclusive of dining and living areas present vistas of the grounds and access to an outdoor Mahogany entertaining deck for weekend festivities. The present home office is a magical space and can be enjoyed as a fourth bedroom if preferred. A spacious, smartly-designed master suite affords luxury and privacy. A three car garage with artist studio equals living beautifully! Available light-filled interiors, high-design quality finishes, and this jewel's indoor-outdoor flow will put a smile on your face. BY THE NUMBERS: 3 BEDROOMS, 3 BATHROOMS, 1 OFFICE, 1 FAMILY ROOM, .743 ACRES, 2,718 SQUARE FEET, 1 FIREPLACE, 1 COMMUNITY POOL, SUB ZERO WINE COOLER, GENERAC GENERATOR, 3 CAR GARAGE, MAHOGANY DECK, TERRAZZO FLOORS.